Israeli PM and Russian president agree to meet in Moscow on Thursday following phone conversation on future of Iranian forces in Syria. Israeli Prime Minister Binyamin Netanyahu has agreed to meet with Russian President Vladimir Putin in Moscow this week, just days ahead of an Israeli general election, following a telephone conversation between the two leaders. Netanyahu, who is running for a fifth term (and fourth consecutive term) as premier in next Tuesday’s Knesset election, will fly to Russia this week for a Thursday meeting with Putin in the Russian capital. The two leaders spoke over the phone Monday, the TASS Russian news agency reported, discussing the future of Iranian military forces in Syria, contacts between Israeli and Russian military forces to prevent accidental incidents in Syria, and “bilaterial issues”, the Kremlin said. Netanyahu and Putin “discussed pressing bilateral issues, including military contacts, and the situation in the Middle East region," a Russian government spokesperson told TASS. 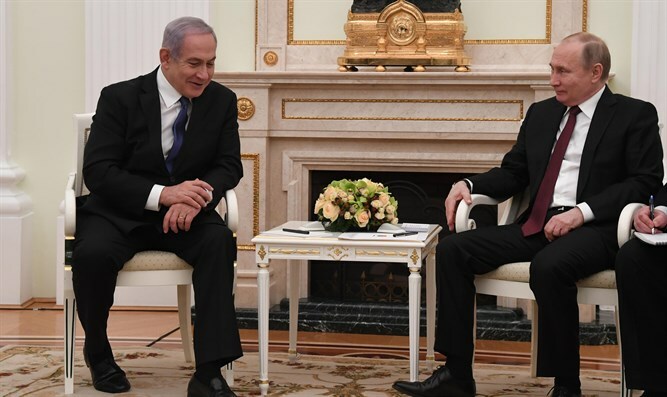 The Israeli premier last met with Putin on February 27th, after pushing off their meeting in a bid to secure an alliance between the Jewish Home, National Union, and Otzma Yehudit parties before the closing the Knesset list registration for the April election. Israel has repeatedly called on Russia to pressure Iran to withdraw its forces from Syrian territory, a presence the Israeli government has declared a “red line” for the Jewish state. With the defeat of the last ISIS stronghold in Syria, Israel has redoubled its efforts to ratchet up pressure on Tehran to pull out of Syria.